*Langoustines may also be offered for sale under the names of Dublin Bay prawns or nephrops. Make sure all the ingredients are at room temperature, before putting a stick blender through them. Pass the mixture through a fine sieve and pour into four small glasses. Place the glasses in a water jacket (aka “bain marie”) before putting them into a preheated oven at 90-100 degrees C for an hour. The Royale is cooked when the mixture has set. Sear the langoustines in a hot pan with a good spoonful of Isigny Sainte-Mère cream and truffle culinary base. 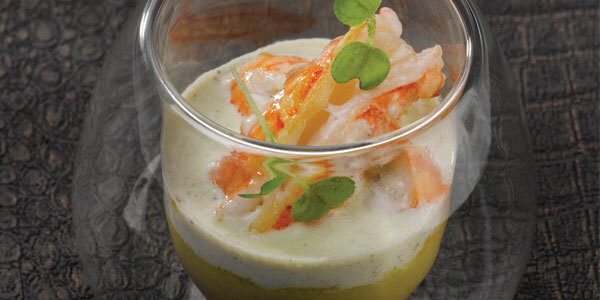 Add two langoustines per person to each glass and serve immediately. This recipe can be served as an entrée or brought to the table as a “mise en bouche” in a small dish shaped as a flat-bottomed spoon. To be eaten warm.